It was late by the time we reached Fez, and saying goodbye to Taha was quite sad. He’d been a superstar driver and sunset buddy throughout our two days. We did offer him a bed to crash at in our Fez Airbnb, but he refused; he probably wanted the comfort of his own bed after driving so many miles with us. That eight-hour round trip (and on two consecutive days) wasn’t something I would have fancied undertaking, so we have to thank him for the laughter, entertainment, tips, chat and for our safety too. We were led off into the labyrinth of the medina by our next Airbnb host. I remember thinking ‘oh-my-goodness, we are SO going to get lost here!’. It felt a lot more compact than the medina of Marrakech, and definitely a lot more intense than the calm of Chefchaouen. Arriving in the dark, late at night was a little overwhelming - and maybe not the best time to arrive into a city that’s easy to get lost in - especially when there so many dark hidden alleyways and streets. If you do happen to arrive at night, I would advise you enlist the help of a guide, your hotel or Airbnb host or just ensuring you’ve someone to meet you – especially if you are travelling solo. Anyway, home for the next couple of nights was amazing. Each of us had a floor to ourselves with our own separate bathroom, and most important of all – a rooftop! I opted for the ground floor bedroom, and with that we went to bed, tired, excited, overloaded with thoughts and more excitement for the next two days. Whenever I’m away visiting a new place, I’m always up super early – mainly through bubbling excitement and my eagerness to get out explore and take photos, and so the next morning – before the call to prayer – and whilst we waited for breakfast to be made for us, I was up and heading up to check out our rooftop view. It wasn’t long before the guys joined me too, and, we were not disappointed. Looking out onto the houses below us and into the distance where we caught glimpses of minarets, clothes lines and satellite dishes feels silent and peaceful. The maze of streets is shielded by rooftops and mosque towers. You would never know that there’s a maze of hustle, bustle, daily life and around 12,000 alleyways just waiting to be discovered. And, how’s this for a fact, apparently only 30 streets here have names! Crazy, huh! 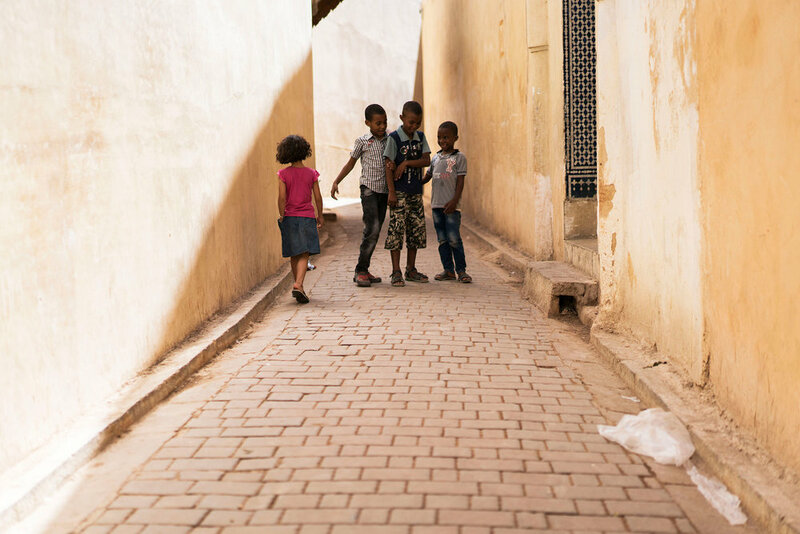 With tummies full of more delicious Moroccan bread, pancakes and all sorts of breakfast treats cooked up by our friendly housekeeper, it was now time to really get lost. 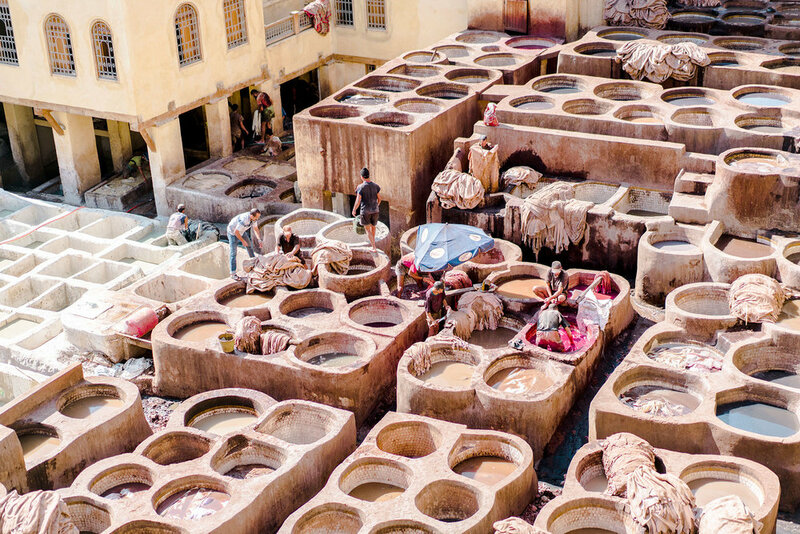 We thought Marrakech was a labyrinth of streets and alleyways all leading into one and another, but oh my, Fez is on another level. It’s totally different to Marrakech. I found it quite compact and for some strange reason, the walls of the city reminded me of being in Italy. I just kept thinking ‘how are we going to get into the heart of this city in only two days?’. My grin from Chefchaouen is making a come-back, and I’m already starting to love this place. The tightly knitted alleyways and streets have you turning around and lost within seconds. Unlike Marrakech, Fez doesn’t really have any real standout landmarks, so we memorise shops, restaurants and the nearest minaret. We amble past donkeys standing patiently, and cats sniffing for scraps of food. We make friends with a jolly chap who emerges cloaked in a white jelleba, we’re intrigued by daily life going on around us, women carry baskets of fresh mint, men sit and sip mint tea; we’re entertained and kept amused…and all the time we take photos. It was interesting that back in Fez the language (other than Arabic) returned to French, so it was back to shouting out our friendly ‘bonjour’s’ – something that made me happy. I really wish I spoke a little Arabic or at least more French. I mean, English is totally usable, but I wanted to communicate with the old men sitting outside their shops passing the time of day. I wanted to know their story, I wanted to find out what life in the medina was like, did they know every street and alleyway? We find ourselves walking past the most beautiful mosque, it was stunning. We couldn’t enter because we’re not Muslim, but we marvelled from the outside. And just like in Marrakech we headed to the university, or Madrassa as it’s known locally. We pretty much had the courtyard to ourselves. 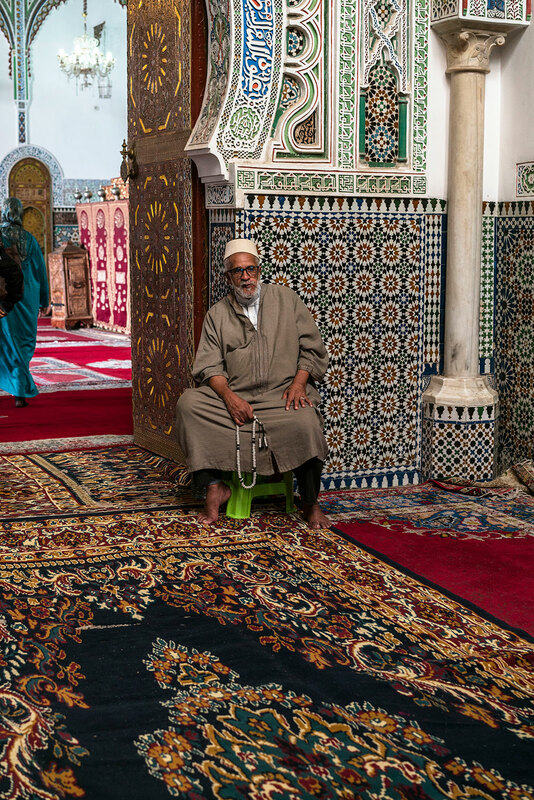 Tourist numbers in Fez do not rival those that head to Marrakech, and that’s what makes the city feel so much more authentic. 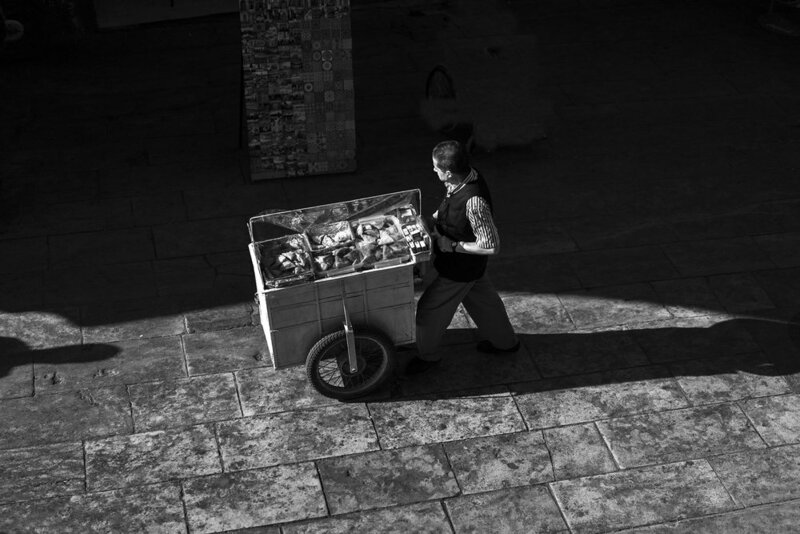 You can breathe without having a huge crowd of tourists surrounding you, and therefore locals are more chilled and not chasing you to buy something from them. Nipon and Andrew decided they really wanted a beer to take up onto our rooftop for our nightly ritual of chats and star-gazing, so just as sun was setting we hailed – with a little help and the parting of a few dirham - a taxi (sheesh, remembering that taxi scrabble was intense. It was a crazy free-for-all, everybody literally pounces on the first taxi to stop, and they all pretty much bundle in shouting at the driver!).. Old Fez gave way to New Fez, and you start to see modern buildings and luxury shops; hotels and proper streets with pavements; and a mall with supermarket complete with a separate alcohol section. This made Andrew and Nipon happy. We picked up some groceries and bread, and that evening we had our own little buffet, followed by star gazing on the rooftop…simple pleasures. The next morning Nipon and I decided to set ourselves a pre-breakfast challenge. From our rooftop, we could see a building in the distance. It didn’t look too far away and it stood out quite distinctly – or so we thought. The challenge was ‘to try and find that building’. Andrew opted for a lie in bed, and so off we went…an hour later we were still walking…could we find that building…. erm, no ha ha, still, it was fun trying..
Our guide then led us through the streets, it was interesting to wander through such a real-life market – I don’t think I would ever tire of walking around Fez’s streets, there’s something different going on, on every street, on every corner. There’s a constant display of life. Chicken strut brazenly in cages, absolutely unaware to their fate on the chopping block…cats sashay everywhere greedily gobbling up morsels of scrappy meat which have fallen to the floor, carcasses of animals hang outside shops, the smell of mint and spices hangs in the air, children in their school coats playfully run in and out of people shopping. 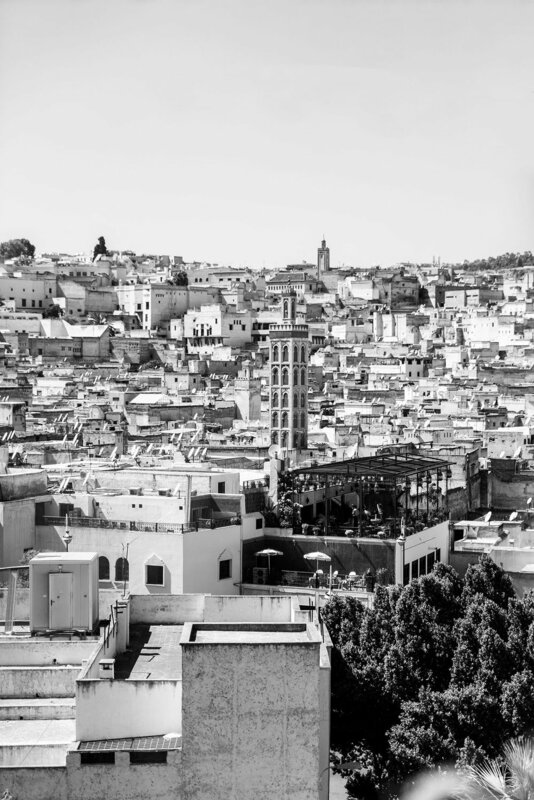 We didn’t feel that hungry, but we wanted to sit and get a panoramic view of the city, and so we headed for a restaurant just outside the medina. And, as we walked through the plush interior of the Palais de Fez, I was thinking hhmmmmm this place looks pricey…but no, not at all. Morocco as a whole is cheap to be in, you can feast like a King or Queen here. The decor is enchanting and romantic, all dim lights and pretty cushions. We headed up to the highest terrace, and a table with the best view. Not only was the view a feast for the eyes, the food delivered was the best I’ve eaten in Morocco. Despite not feeling that hungry, we were served little plates of the most delicious salads. Just thinking about the caramelised aubergine with walnuts sprinkled on top, the sweetest tasting carrots, beetroot, tomato and cabbage makes my mouth salivate. We filled up on these tasty mouthfuls of what I’m going to describe as ‘joy’…and then the best couscous (verging-on-legendary) appeared, and oh-my-gosh was it GOOD. Sitting outside with a view of the city, the sun shining down on us was such a happy feeling. I could have eaten every little grain of couscous had my tummy allowed, but we were so full up, and so we asked to take a doggy bag home with us – it really was that good. Come here and you will be one happy traveller! From here we could see the building from the pre-breakfast challenge. None of us are easily defeated, and so we decided to set about and hunt for it again. We blagged our way into several places to get to the roof for a better look, but the building still availed us. It was a fun little mission even if we didn’t succeed…and maybe next time we’ll have better luck!